The fungal infections on the potato can occur while the crop is in the field or the store. The diseases affect both the foliage and the tubers. The affected plant can wilt, have stunted growth, rot or develop disfigured tubers. Also, when the fungal diseases induce rotting it reduce the marketability of the crops. But are you all helpless about such a looming loss? With the correct fungicides, you can suppress and save your tubers from soft rot and other related diseases. However, you have to spot the potato fungal infections in time. So the purpose of this post is to help you identify the diseases. The fungal disease is mostly a problem in temperate zones. Although there no visual signs above the ground for the powdery scab attack, it attacks the tubers surface. Initially the tuber develops small light colored swellings. Later the round swellings become dark and the swellings open to reveal a powdery spore mass. The disease commonly called the blackwart is usually identified by the powdery scab. It causes the swellings to develop on the stem, tubers, and stolons. Although the symptoms are mostly underground, during the wet season the signs spread to the stem and leaves above the ground. The tumors eventually darken and rot. Late blight forms one of the dangerous potato fungal diseases. It is characterized by the water soaked wounds on the leaves. After short time the wounds turn black and eventually dry up with a black color. The lesions are usually surrounded by a yellow margin. In additions the wounds also appear on the stem and petioles with a brown or black color. The infected tubers develop brownish discoloration. Eventually the blighted tissues rot. The fungal disease is marked by the tubers becoming dark brown and water soaked too. At times the texture on the tuber also changes and become rubbery. When you cut through the affected tuber, within minutes it changes to pink and finally black color. In addition the stem wilts and decays whereas the leaves develop chlorosis. Apart from the decay there is also the faded vinegar like smell. The disease mostly develops on the potatoes during the arid situation. The old powdery mildew infection closely resembles the late blight. First the leaves develop whitish spores which appear to be soil residue or spray deposits. The fungal disease is marked by the appearance of the brown angular spots on the leaves. Usually the spots first begin from the leaf underside during the flowering time of the potatoes. Eventually the spots multiply. Although the spots concentrate on the leaves, traces are usually visible on the stem. To the early maturing potatoes it leads to severe defoliation. The tuber on the other hand rots wit the dark color and leathery texture. The disease is common in hot and moist weather. The leaves of the attacked crop wilt and turn yellow. The stem develops brownish wound at the area slightly below the soil surface. As the infection intensifies, the stem sloughs off thus exposing the vascular tissues. The tuber becomes grayish brown and eventually slimy too. In addition to the stunted growth of the crops, you‘ll notice the tubers rots and gets dark. The cross sectional view of the tuber reveals the striate deepening into the tuber. The fungus causing the stem cancer can be found in the soil or even the leaf remains. To the potato plant it causes lesions to appear on the tips of the sprouts. In addition it also delays the development of new sprouts. Furthermore you will also spot the brown cankers on the stolons and stems. Consequently the diseases may prevent the girdled stolons from developing tubers. When you look at the tubers, you will notice the hard dark brown bodies on the infected tuber. The disease mostly affects the potatoes at the storage facilities. It makes the tubes to have dark sunken lesions. As the disease intensifies, you will notice the concentric rings on the potato tuber. On the other hand the fusarium wilt is characterized by the yellowing of the foliage, and finaly they wilt. On the other hand the stem discolors. The tubers too get discolored both internally and externally and depict brown sunken eyes. To suppress Fusarium Dry rot use mancozeb or Fludioxonil fungicide. The fungal disease attacks the potato tubers either in the field or at the store. The infection can come from the soil, seed tubers or remains of the spores in the store. It begins by the appearance of tiny silvery grey spots on the tuber. The spots eventually widens into circles with dark margins. Before washing the infected tuber has the sooty outward show. 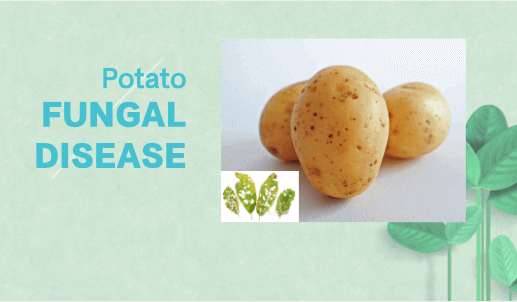 The fungal disease affects the stem, stolons, roots and even the tubers of the potato plant. It is easily identified by the many black dots on the infected parts. The tubers may assume a gray or brow color over a large potion. Alternatively the discoloration may take the round pattern with a diameter of about a quarter of an inch. To control the black dot treat the planting seed with Azoxystrobin. The fungal diseases like late blight and powdery scab are a real threat to your potato farm. Why must you leave your crops vulnerable to the diseases? Remember not all the symptoms of the infections are visible on the plant leaves. That’s why you have to read between the lines of the above infections and stay on the alert. With the correct fungicides, you can avert the whole rotting of your potato plantation.